Researchers from the Harvard School of Public Health reported that men who drink coffee regularly also seem to have a lower risk of developing a lethal form of prostate cancer. Additionally, the lower risk was evident in men who drink either regular or decaffeinated coffee. The study was published in the May 17 online edition of the Journal of the National Cancer Institute. Prostate cancer is the most frequently diagnosed type of cancer among US men and also the second leading cause of death due to cancer. The lethal form of prostate cancer is the one that causes death and also spreads to the bones. Discovering the beneficial effects of coffee may be a hopeful sign for men. The researchers studying coffee because of the many beneficial compounds that it contains that act as antioxidants, reduce inflammation and regulate insulin. All of these functions are known to influence the development of prostate cancer. The study involved 47,911 US men who took part in the Health Professionals Follow-Up Study. The participants reported their coffee consumption every four years from 1986 to 2008. During the study period, there were 5,035 cases of prostate cancer reported which included 642 fatal or metastatic cases. After examining the data, the researchers found out that the men who consumed around 6 or more cups of coffee daily had about a 20 percent lower risk of developing any form of prostate cancer. The association was even stronger for the aggressive form of prostate cancer. The men who drank the most coffee daily had a 60 percent lower risk of developing the lethal form of prostate cancer. 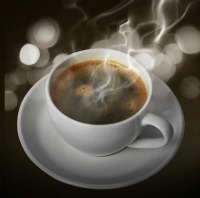 The effects of coffee on prostate cancer may not be due to its caffeine content. The researchers saw the same reduced risk for those who drank either regular or decaffeinated coffee. Those who drank just 3 cups of coffee a day even showed a 30 percent lower risk of lethal prostate cancer. Another thing that researchers noticed is that coffee drinkers were likely to smoke and less likely to exercise, behaviors that may increase prostate cancer risk. These and other lifestyle factors were also controlled for in the study and yet coffee drinking was still associated with the lower prostate cancer risk. The study is considered to be at its preliminary stage and may need to be further validated by additional populations that have a wider range of coffee exposure and a larger number of prostate cancer cases. Additional studies are in its planning stages to help researchers further understand the specific mechanisms behind coffee drinking and the lower risk of lethal prostate cancer.